Superstore has really been getting morbid these past few weeks. Two weeks ago we had crows being brutally murdered. Last week we had people being kidnapped, murdered, and eaten. This week we have puppies potentially being euthanized. I don’t know if the show got a fresh crop of slightly disturbed writers (and really, what writer isn’t slightly disturbed? ), or if they’re just gearing up for Halloween in a big way. Or, perhaps, the show is simply entering its teenage rebellious phase now that it’s in season two. Whatever the reason, I’m going to wait it out and hope they find more even footing in the coming weeks. 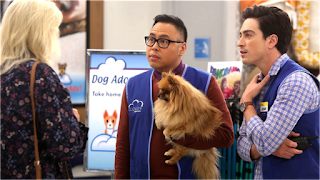 In the meantime, let’s recap this week’s episode in all its doggy disastrousness. It’s dog adoption day at Cloud 9, which means a fleet of adorable pups has arrived and some lucky staff members need to volunteer for dog adoption duty. Glenn, however, doesn’t tell the employees what the assignment is; he simply says he needs two volunteers. Mateo volunteers right away, and after it becomes clear no one else is interested in one of Glenn’s special assignments, Jonah reluctantly raises his hand, too. When it’s revealed that Mateo and Jonah will be puppy-sitting all day, everyone else is super bummed. I mean, who doesn’t love cuddly puppies? Well, Jonah, as it turns out. He is quite ambivalent toward dogs and says he doesn’t understand people’s desire to spend so much money on pets when there are starving children in the world. No one understands this logic. When Mateo and Jonah meet the dog lady who dropped off the dogs, she reveals that any dog not adopted that day will be euthanized. She’s pretty excited about it since she’s dating the injection guy and she only gets to see him on euthanizing days. Despite Jonah’s ambivalence toward dogs, he’s horrified at the thought of any of them dying. 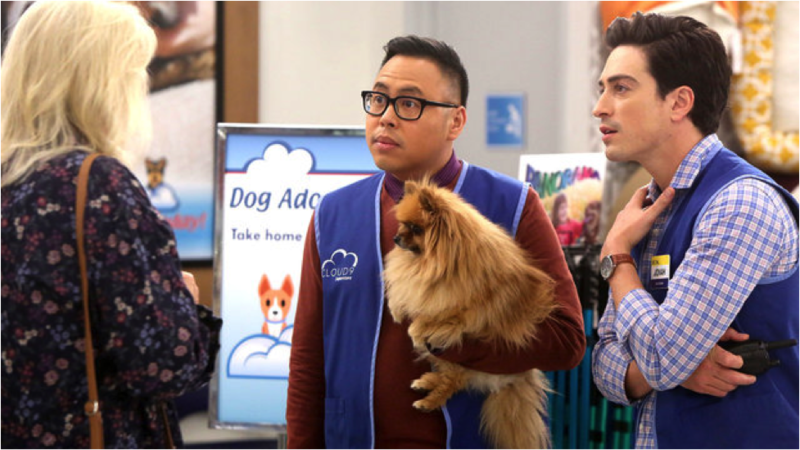 He and Mateo, who have never exactly liked each other, decide to lay their differences aside and work together to get all the dogs adopted before the dog lady returns at 6 p.m. Meanwhile, Dina and Garrett are in a battle of wills about store rules. Dina lets Garrett know he forgot to clock in that morning and that he won’t be paid for hours he wasn’t clocked in. Citing store policy, she refuses to just adjust the time sheet to reflect his hours actually worked even though she has the power to do so. Two can play at this game, however, and at lunchtime, Garrett swoops in just as Dina’s sitting down to eat, telling her she only has 45 seconds left of her 15 minutes lunch break. She protests – after all, she had to use most of her lunch break re-tightening her ponytail. But “rules are rules” Garrett says, and begins counting down the seconds, causing Dina to begin shoveling her overheated lunch into her mouth and burning herself in the process. Cheyenne and her fiancé, Bo, are having some issues of their own. They’re in Cloud 9 doing some grocery shopping when they begin to fight over what type of chips to buy. Glenn and Amy rush over to help and sit them down for a little couple’s counseling. Turns out they’ve been having a hard time connecting since the baby was born. Cheyenne believes the solution is to move the wedding up – to next week. Amy, who has never liked Bo, is hesitant but Glenn is all in. He offers to book the wedding at his church and take care of all the details. While Glenn is in wedding planning mode and Bo is busy eating chips, Amy takes Cheyenne aside to talk to her about not missing out on life. Cheyenne admits that all her friends thought she was crazy for dating Bo when there was a different guy at school, Cole, who liked her, too. Amy presses for more information about Cole. Turns out he was always reading, or busy with debate team – serious and mature. Amy encourages Cheyenne to call Cole and see if there’s something there. Better to explore her options now before making a lifelong commitment, reasons Amy. Cheyenne takes Amy’s advice and calls Cole. He comes over to the store right away, but he’s not quite what Amy envisioned. Turns out Cole was Cheyenne’s sophomore English teacher, and he’s more than a little creepy. While Amy rethinks her advice to Cheyenne, Glenn is trying his best to help Bo out. Bo has revealed that a lot of his frustrations stem from them living in Cheyenne’s mom’s basement, which is a pretty cramped place for a couple with a baby. Glenn knows a realtor from church and decides to take Bo house hunting with her help. They find an adorable house that’s just the right size for a young couple starting out. Though it doesn’t have all the things Bo was hoping for – like a double staircase that meets in the middle or an aquarium big enough for a small shark – he decides it’ll do. There’s a snag, however: the realtor expects Glenn to cosign the rental agreement just in case Bo can’t pay, which seems fair. After waffling a bit, Glenn agrees to sign. He just can’t face the idea of not helping Cheyenne’s baby grow up in a loving home instead of a dank basement. Garrett is still holding Dina to the letter of the law when it comes to store policy. When she attempts to take her second bathroom break of the shift, Garrett is there to block her way. According to the handbook, employees are only allowed to take one bathroom break per shift so Dina will just have to hold it until she gets off work. She claims this doesn’t bother her – she’ll be just fine – and storms away. The dog adoption seems to be the only thing going well today. Jonah and Mateo are managing to work together really well, thinking up all sorts of schemes to get the dogs adopted, from claiming one dog is a woman’s dead husband reincarnated, to leading customers to believe the dogs are animal actors who have starred alongside the likes of George Clooney and John Leguizamo. Meanwhile, Amy has managed to convince Cheyenne that Cole is no good for her and maybe Bo isn’t so bad. Cole isn’t about to take no for an answer, but just as he’s trying to creepily convince Cheyenne to get in his car, Glenn and Bo arrive. Bo starts a fight with Cole, which convinces Cheyenne that she and Bo really do belong together. She decides they don’t have to get married right away after all. In addition to the new house, Bo has another surprise up his sleeve: he’s just adopted all the remaining dogs. They’ll help babysit the baby, he explains. The end of the day has finally arrived, which means Dina is off work and can go to the bathroom. But Garrett isn’t letting her off the hook that easily. Apparently, according to store policy, the bathrooms are only for paying customers. Dina grabs a stapler and gets in line, vowing her revenge on Garrett, who just laughs. He’s not scheduled to work another shift with her for a while so he’s not too worried. Mateo and Jonah are pretty proud of themselves for getting all the dogs adopted. The dog lady, however, is disappointed. This means she won’t get to see the injection guy until next week. But, after giving herself a little pep talk, she remembers that she’s an adult – she can always call him. Or text him at least.